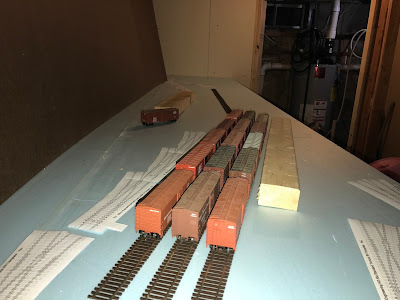 A bit of a preview about some other things I'll be posting soon, but the main reason for this picture was to test out a new mock-up for the freight house. 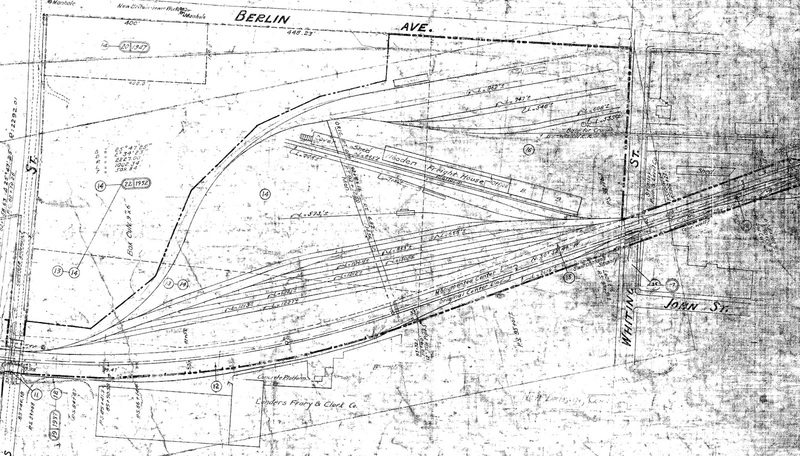 The freight house was located at the Whiting Street Yard on the Berlin Line, and is quite large. 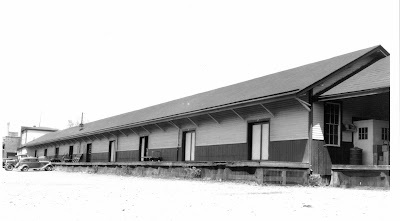 This is the north end of the freight house, truck side. The south end, also truck side. And this is the track side. There were three tracks servicing the freight house, although the specific layout means that only the back half of the tracks could be bridged by plates. It appears that there were 17 spotting locations per track, not including the open platform at the far end. 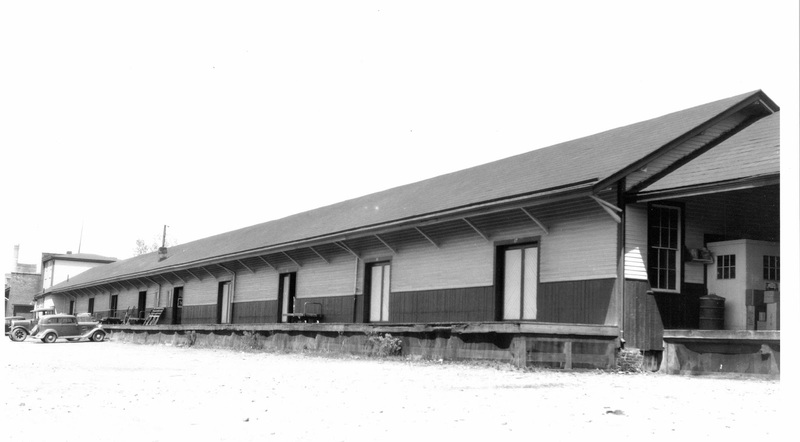 The track closest to the Freight House is 845 ft. long, or enough for about 20 to 21 40-foot cars. The single track that is between the yard and the freight house appears to be the scale track for a 42 foot, 100-ton scale. I'm assuming this was used to weigh cars loaded at the bulk tracks. The bulk tracks swing behind the yard, and include a 15-ton pillar crane and a concrete unloading (undoubtedly used for cars among other loads). One of the bulk tracks continues across Whiting Street as a siding for Stanley Tools, the third of three Stanley plants in the city. So after realizing how many spotting locations I'll need at a minimum, I was considering whether I would have that much space. As it turns out, if I stick with a prototype layout of three tracks, I can. I might have to space the tracks closer than the usual 2" on center that I've been using, but that's actually more prototypical and looks better too. I also figured that 1947 (or 1946) would be the busiest, and that the traffic would decline as we operate in future years. So here's a compiled listing of the arranged service from New Britain for several more years. Inbound from Cedar Hill Transfer (daily), Hartford (Mon, Wed, Fri) and Maybrook (Tue, The, Sat). The Springfield move is interesting, it goes south to Cedar Hill to then go north up the Springfield line. Inbound from Cedar Hill Transfer, Easthampton, Hartford (Mon, Wed, Fri), Maybrook Transfer (Tue, Thu, Sat), Meriden, New York (Harlem Station), Northampton, Westfield, Williamsburg, plus truck from Berlin and East Berlin. Not sure why Holyoke is listed twice. No way I'll be able to accomodate the 1952 schedule. I just don't have the space for that. But with the triple track I can manage 18 spots, or 15 loading, 3 unloading spots. The crews will just have to switch out cars as they are unloaded. However it pans out, it appears that the freight house will be a more significant industry in operations than I thought. Each morning it will need 5 to 10 empties, plus the incoming loads. Outbound will be anything between 3 cars to clearing out all of the house tracks. It's also entirely possible, and perhaps probable, the the cars that are loaded only 3 days a week are spotted only on those days. Since the railroad pays a per diem, they wouldn't want a car just sitting there, but a New Haven owned box car could. Otherwise they probably staged the load in the freight house the first day, and loaded it the second day once the empty was spotted. Modeling from a Photo: Rare or Not?